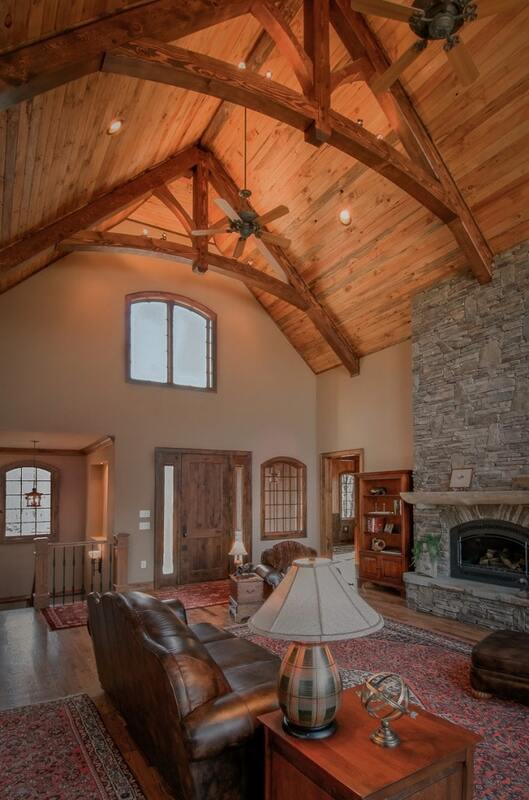 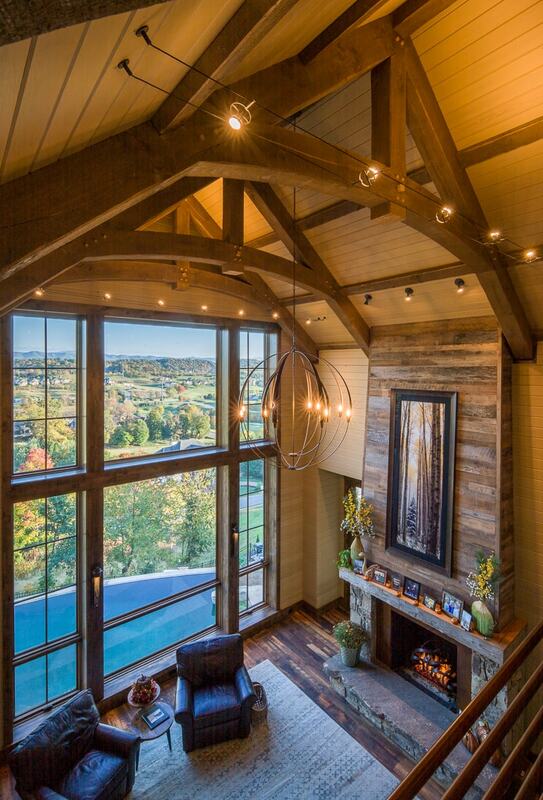 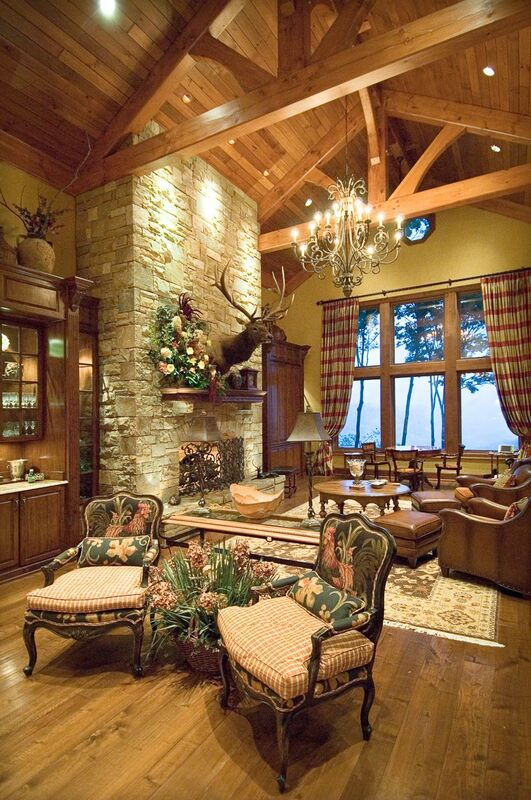 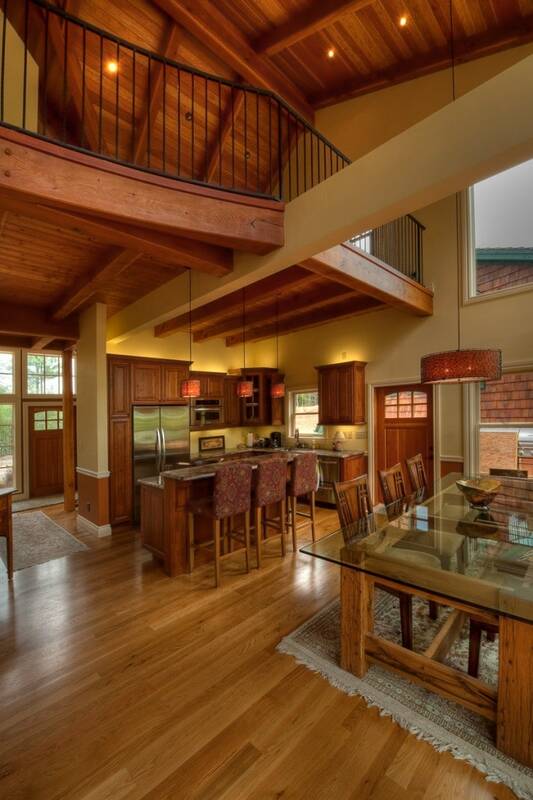 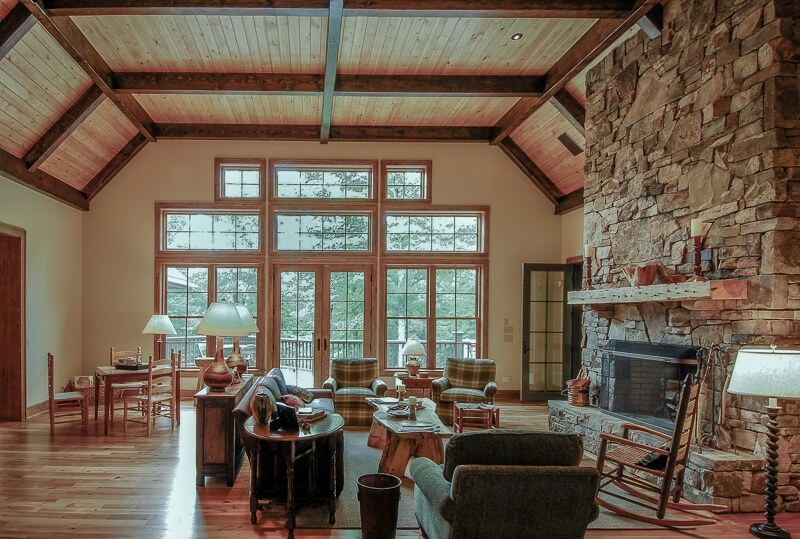 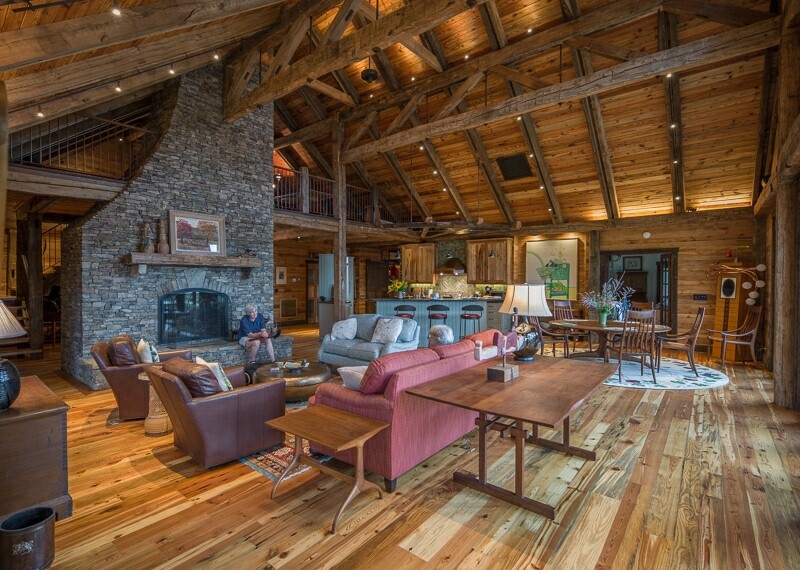 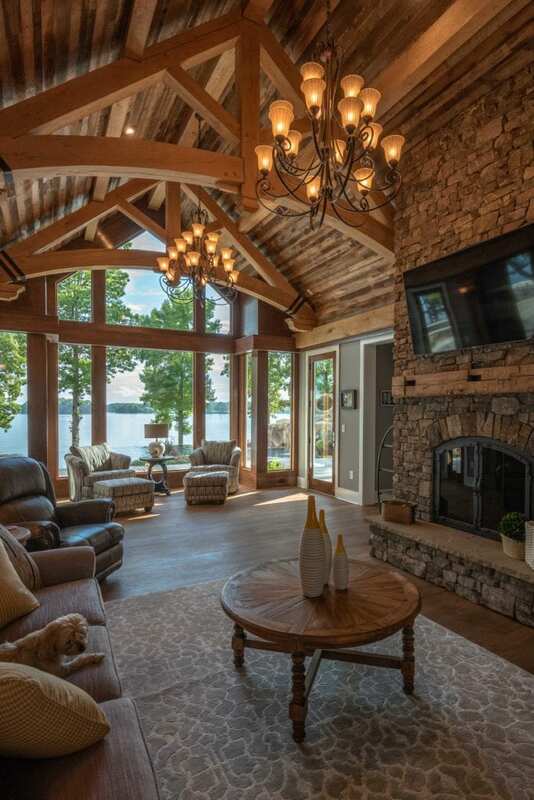 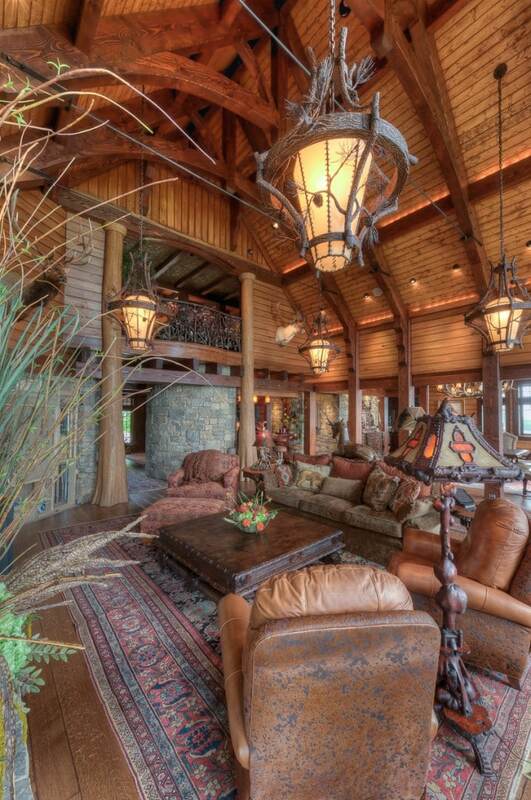 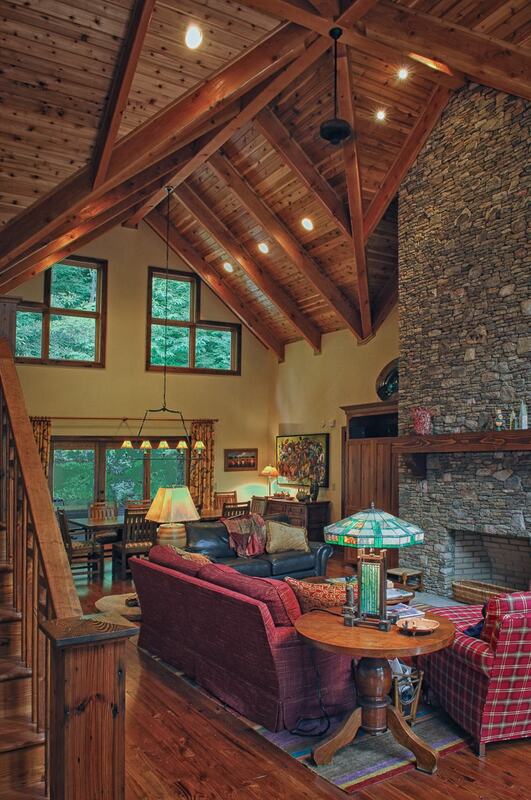 Eastern White Pine timber frame trusses and ridge beam with curved braces give this Great Room a lodge-like feeling. 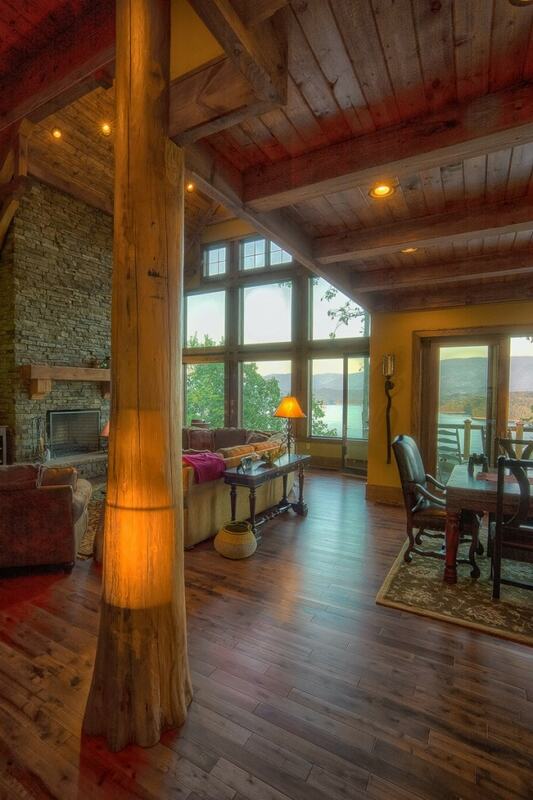 One thing about wood posts: people like touching them, and we think the round Cypress log posts in this Virginia lake house will get a lot of attention over the coming years. 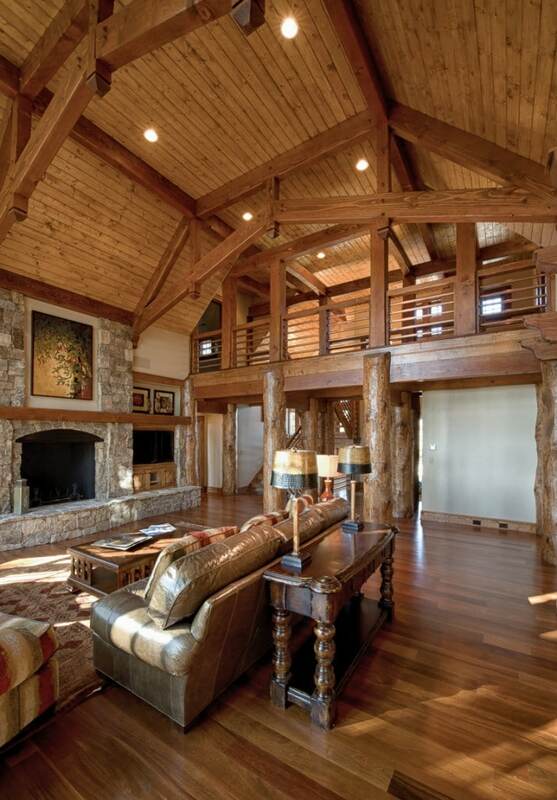 One of the first timber frame homes we built using radio frequency kiln dried (RFKD) Douglas Fir timber. 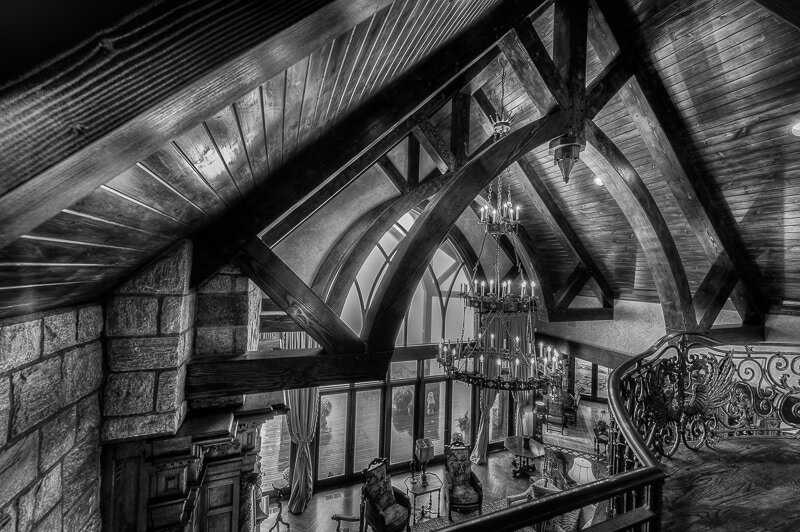 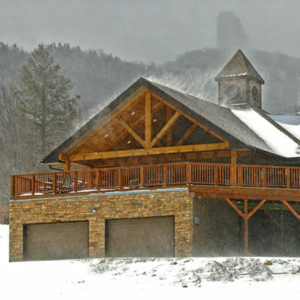 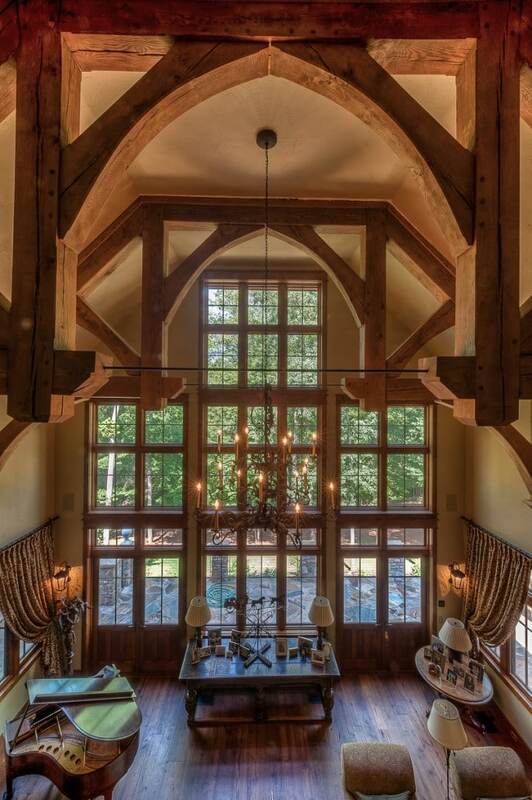 Yes, this is a timber frame castle in Banner Elk, NC. 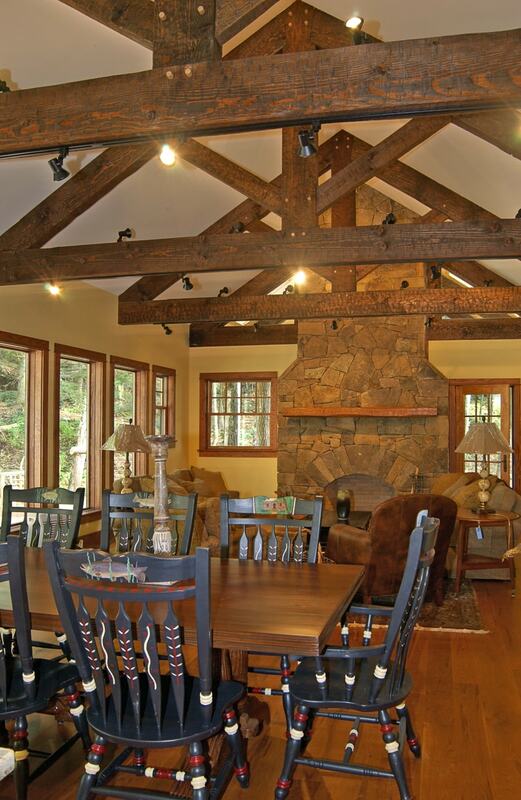 We built the timber frame trusses from Radio Frequency Kiln Dried (RFKD) Douglas Fir. 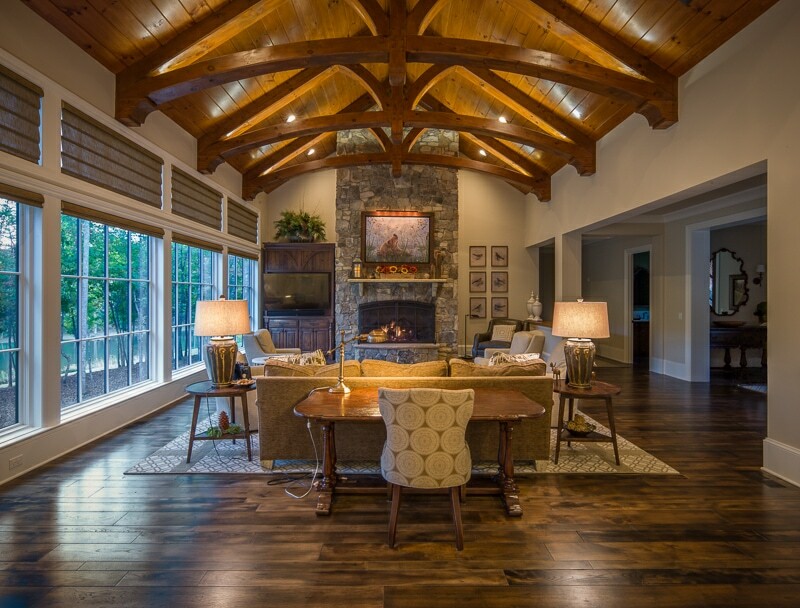 Radio frequency kiln dried Douglas Fir trusses and a ridge beam add visual interest and a mountain feel to this living room in a mountain home. 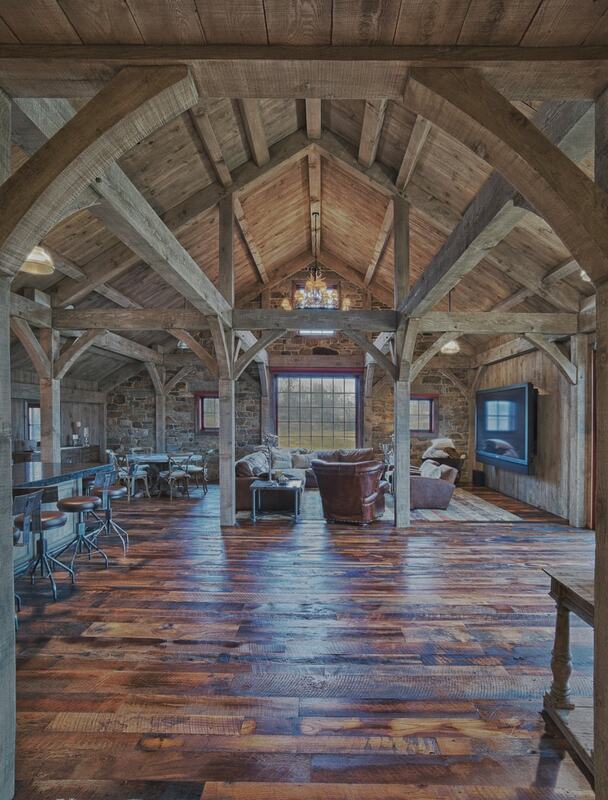 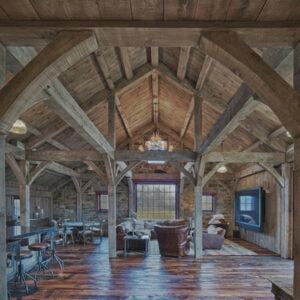 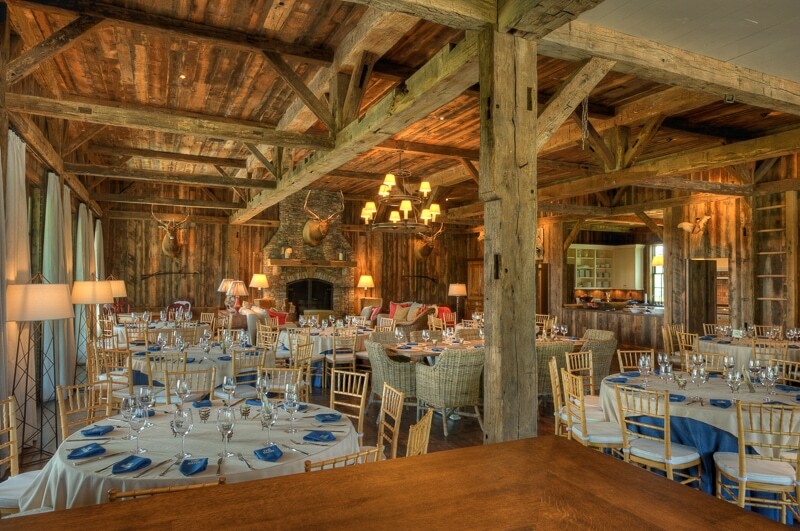 One of our favorite barns: a two-story Party Barn in Bedminster, NJ. 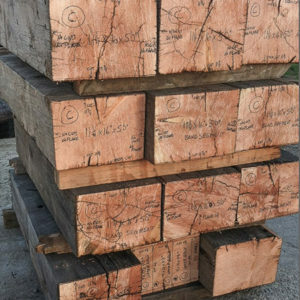 We cut the timber frame from new rough-sawn Douglas Fir timber which was subsequently faux-finished to mimic the appearance and patina of reclaimed timber. We like how curved timber softens the lines of timber framing–as in the curved struts and lower chords of these King Post trusses. 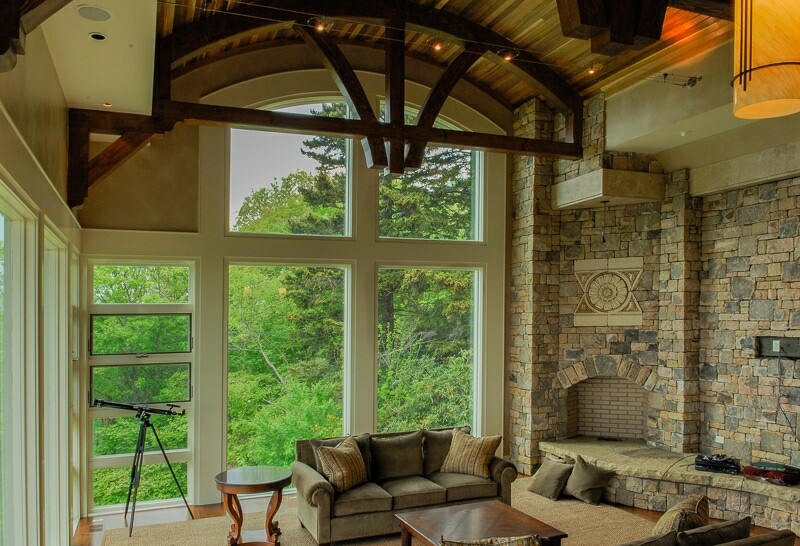 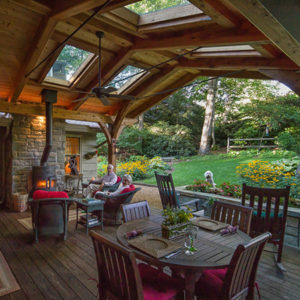 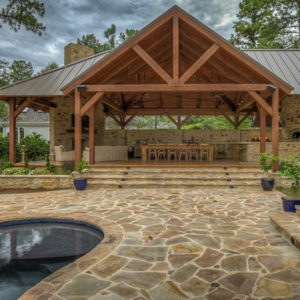 We like how the curved lower chords in these Living Room timber frame trusses soften the straight lines of timber framing–in addition to replicating the radius of the curved window. 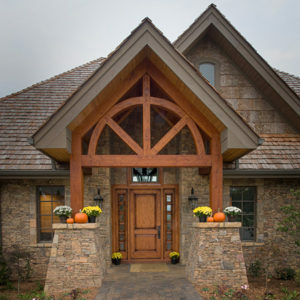 Note also the subtle curve in the bottoms of the arched timber braces. 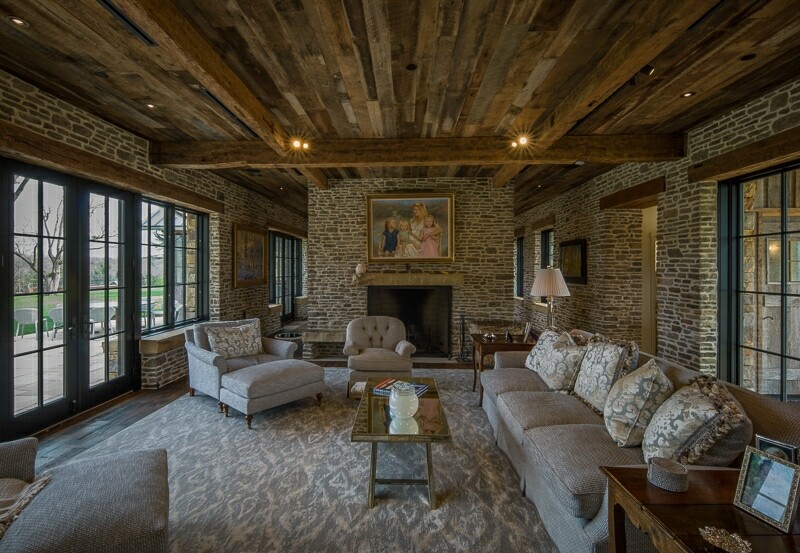 The Owner desired more sustainable and dimensionally stable wood than green timber, so we sourced Standing Dead Ponderosa Pine for the ceiling beams in this NC Living Room. 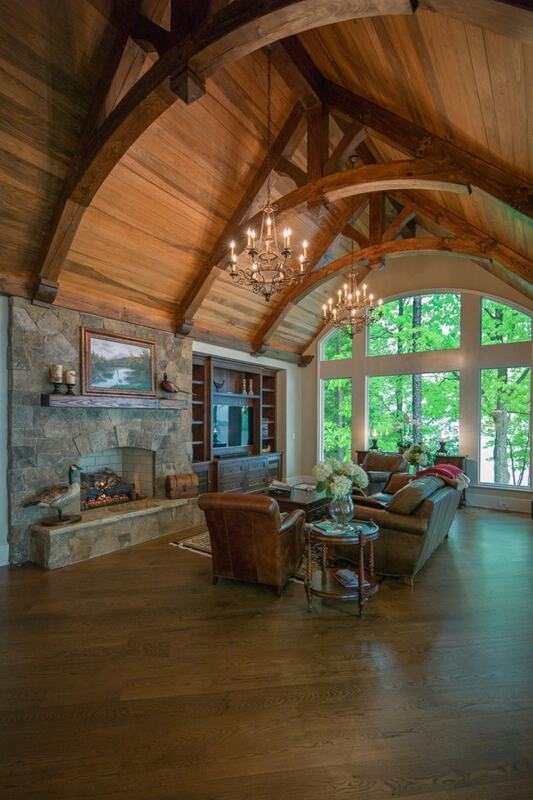 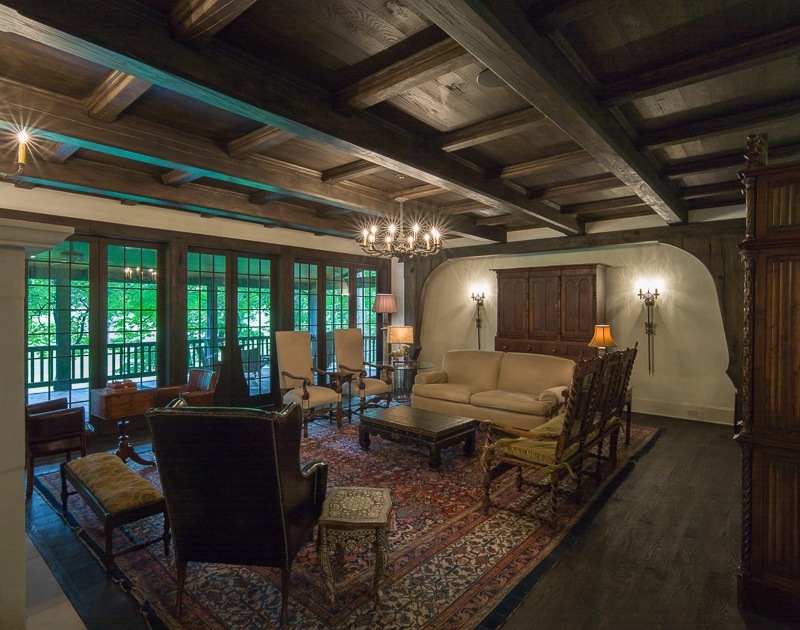 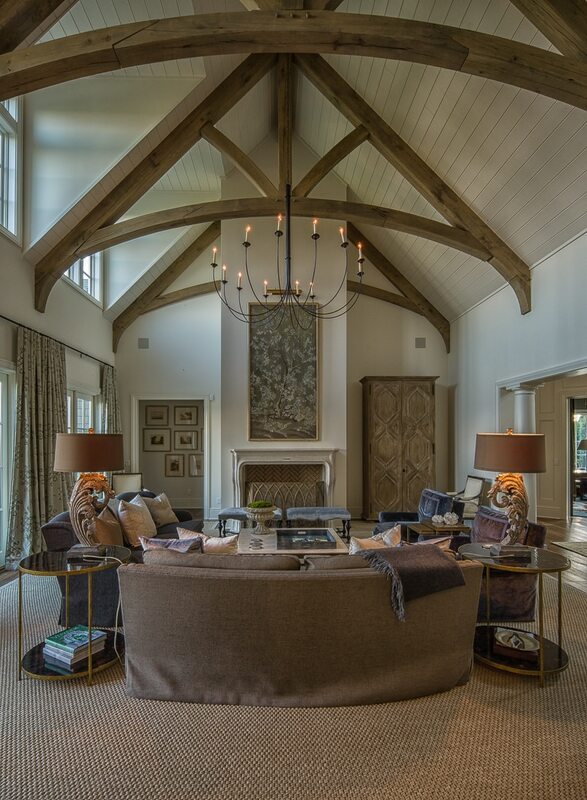 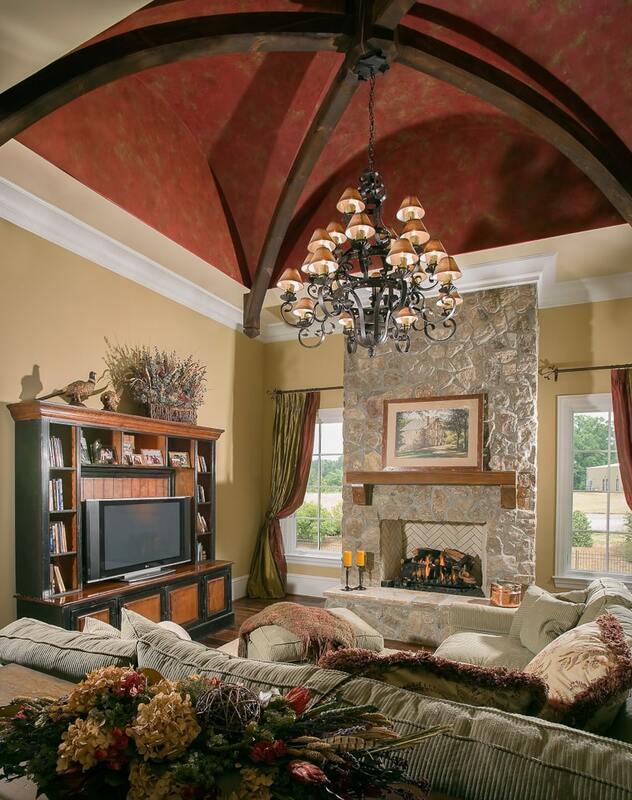 A timber framed Groin vault from Eastern White Pine timber in a Charlotte, NC Living Room. 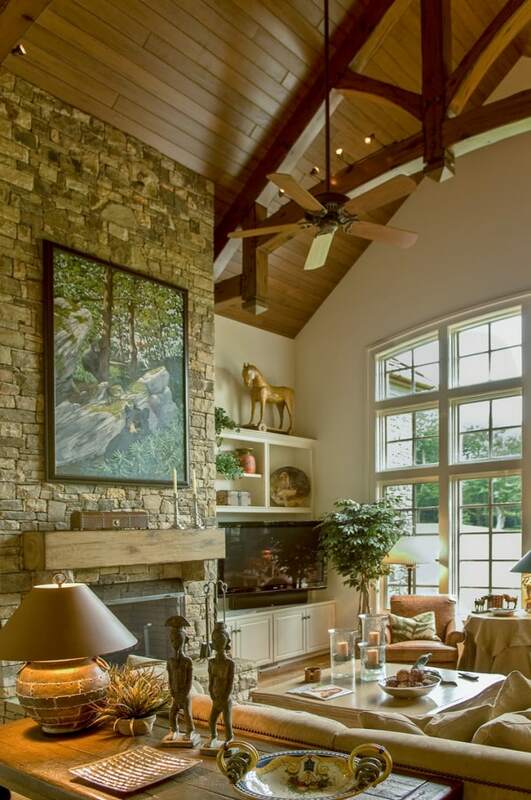 The freestanding fireplace focuses all living areas and helps define each space. 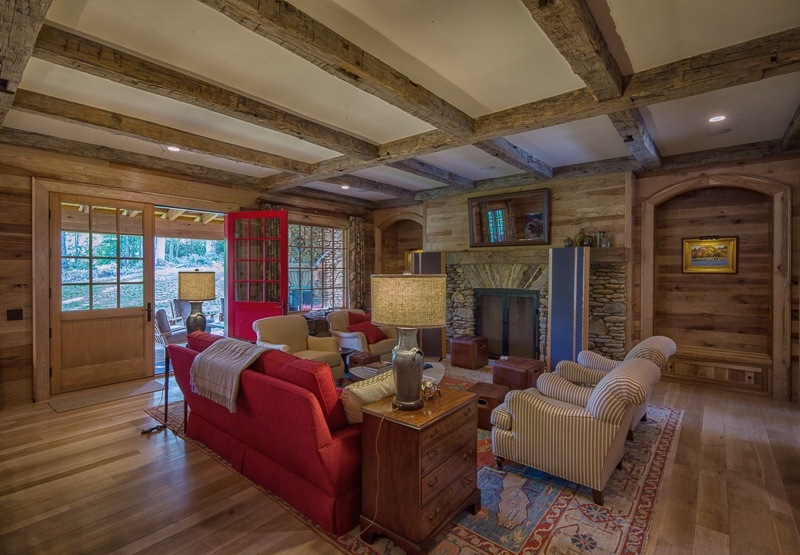 The timber frame further helps delineate spaces into sedentary, work areas and circulation, introducing a rhythm to the volume that keeps the scale manageable. 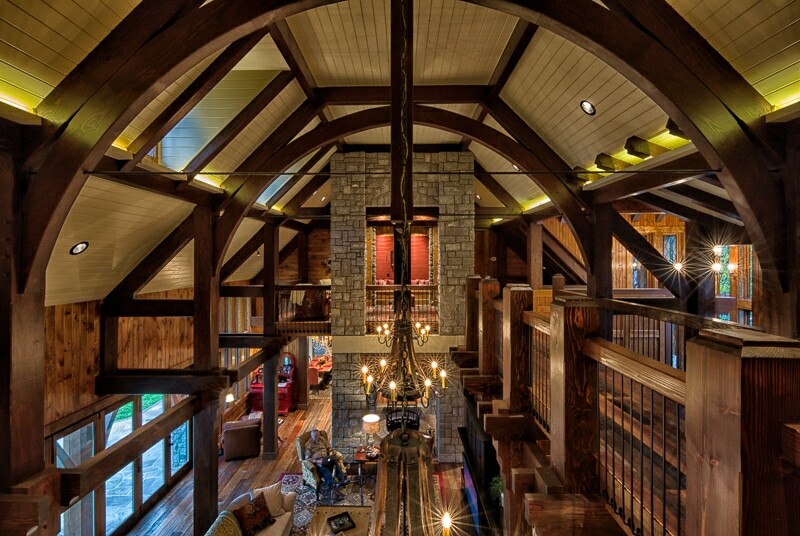 Design and comments by Bob Mann of A.T.T.I.C. Design in Banner Elk, NC. 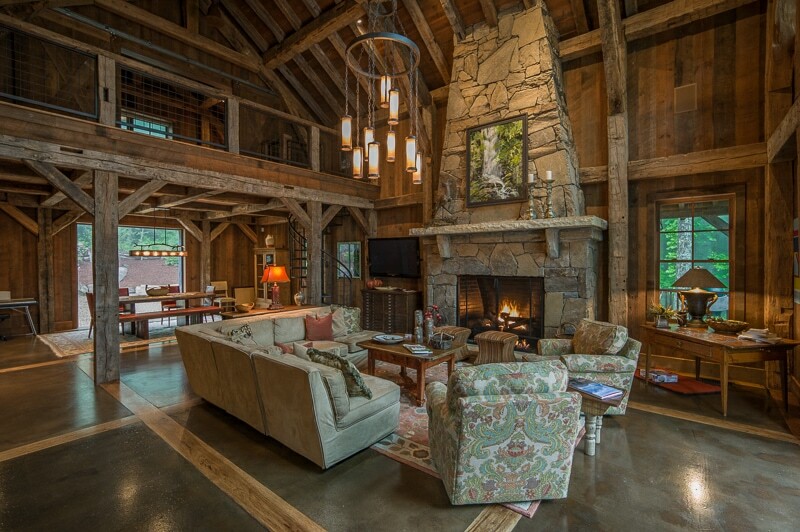 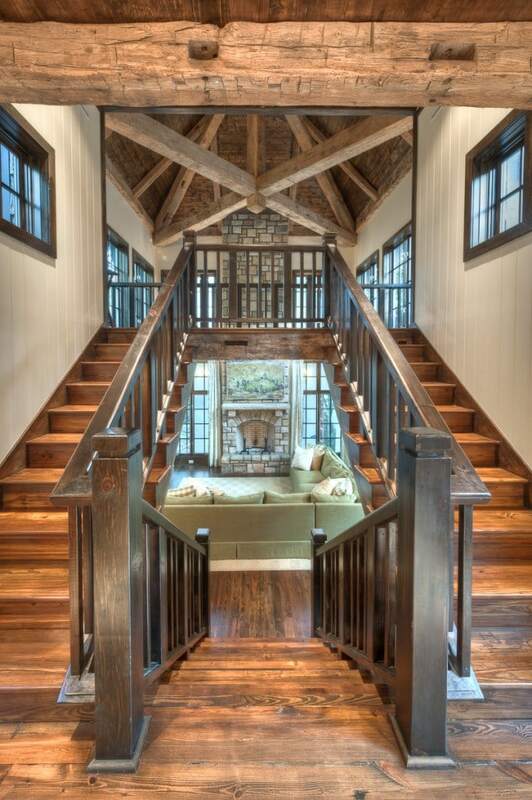 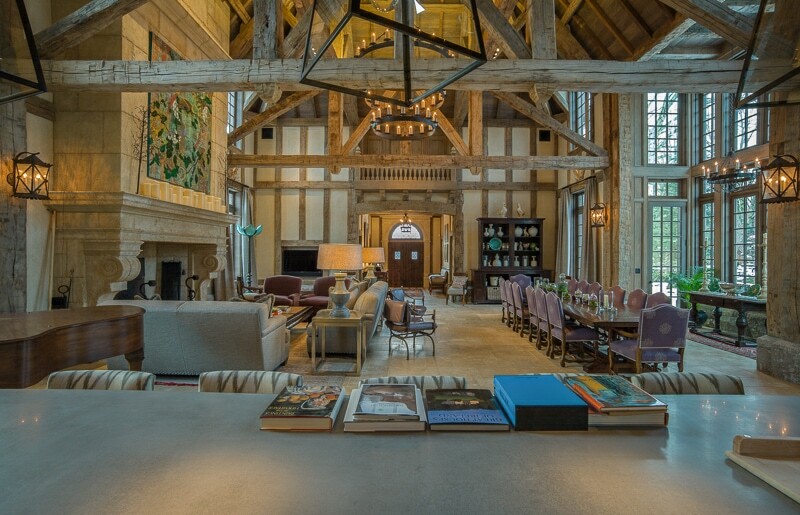 A structural reclaimed wood timber frame Great Room in Highlands NC. 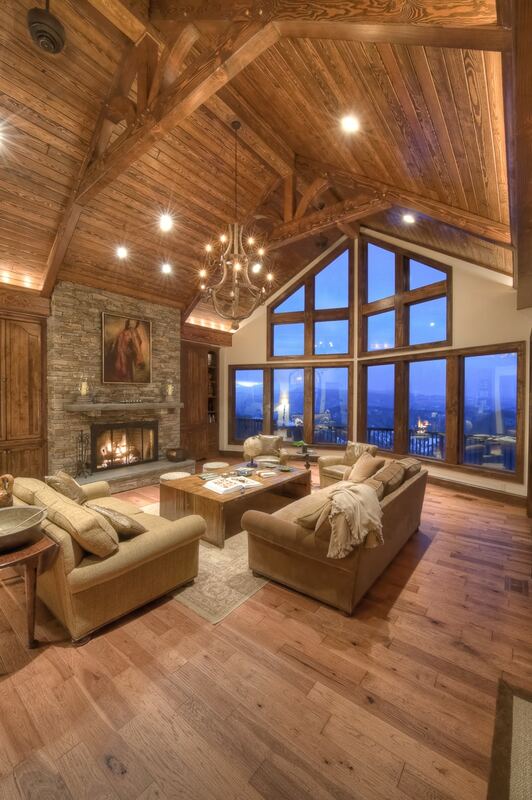 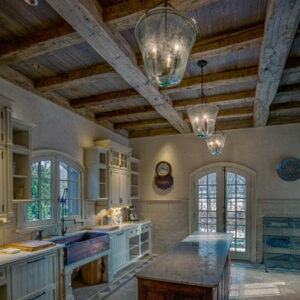 Design by RMT Architects of Avon, CO.